I read somewhere recently that Western Scrub-jays just go wild for peanuts and that you can even train them to take them from your hand. Well, I picked up some roasted, but unsalted, peanuts at the grocery store. I filled up a feeder-cage of them one evening, but by the time I got home from work the next day, there wasn't a single peanut left. Lesson learned. Now I just put out a few peanuts at a time when I am around to watch them disappear. I've taken a couple opportunities to set up my make-shift blind or simply sit on the ground within a few feat of the feeder covered in camo-netting...all this to observe their quirky behavior and to get some close-up photos to share with you good folks. 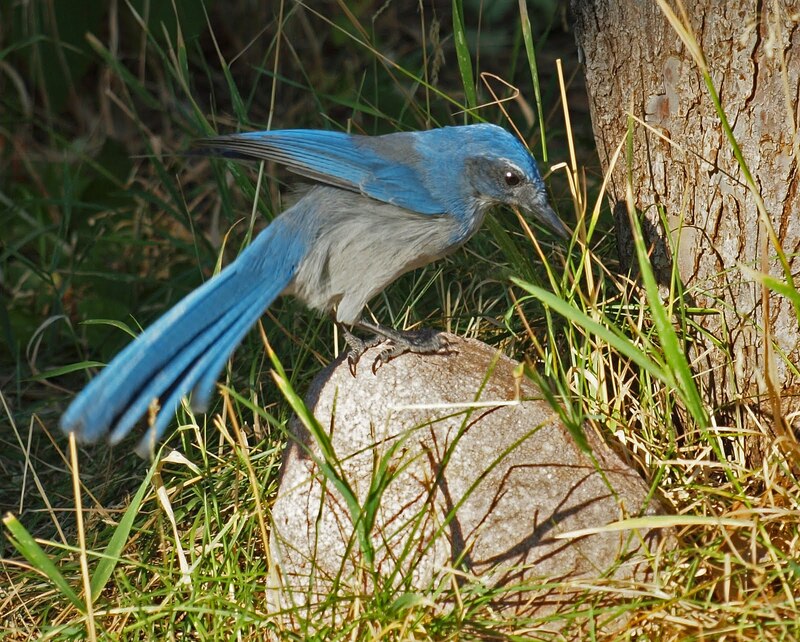 Here is what I have observed about Western Scrub-jays and peanuts. Once one scrubby finds the treasure, it begins calling others. Within seconds, three or four scrubbies are present in the tree above my hanging platform feeder. They squawk at each other a bit, most likely communicating their secret plan of attack. One or two scrubbies dance around the lower branches to distract my attention. Meanwhile, one intrepid scrubby will drop down to a lower branch, then to the fence, and then as quick as a thief in the night, will drop to the tray, grab a nut and immediately bolt sending its companions flying off too. The distraction technique combined with the oh-so-sneaky jay grabbing that peanut and quickly darting has left me struggling to capture clear photographs of the entire action sequence. I've also watched to see what the Scrub-jays do with the peanuts after they've nabbed them. I have seen them hiding them in the flower beds and carefully covering them with leaf litter. I think its hilarious that they go to the effort to collect the nuts and then hide them in plain sight so nearby. I also see that they have a little stash under the neighbors swamp cooler up on his roof. So, while they will often eat the shelled peanuts right away at the feeder, those still in the shell are shuttled off and cached for future use. Once one peanut is taken, I know that the greedy little suckers will be back soon enough. They just can't resist the allure of the peanut. 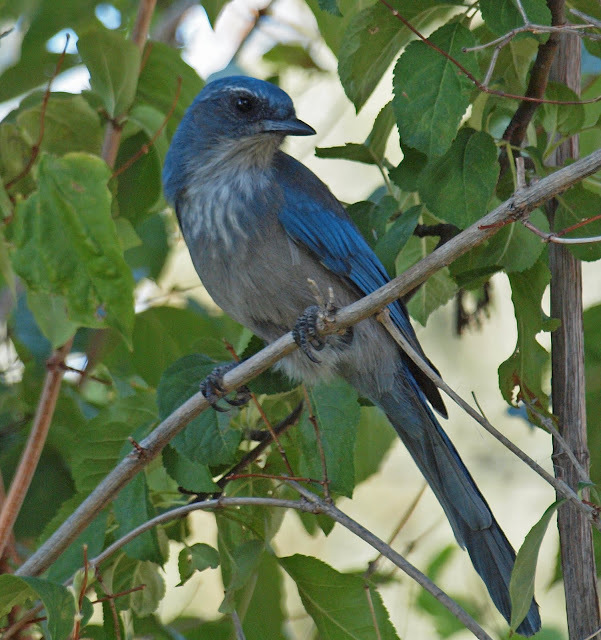 Not a peanut falls without a Scrub-jays notice. They seem to know exactly where it landed, as shown in the next photo where a peanut had fallen behind a rock earlier. A peanut had just fallen and there was no way that this scrubby was going let that peanut get away. Wow the next to the last photo is fantastic...I love that flurry of feathery blue. Jays are funny no matter which type they are, always similar antics!! The peanut story is comical..!! Oh those rascally Jays! Great shots..I like the one you captured of the jay diving for the peanut. Have a Super time at the Midwest Birding Symposium. I will be following your tweets and posts. Say Hi to the blogging gang for me. Great shots! Here in MI, the Jays put one peanut (in shell) in their gizzard and then another in their beak. They happily take peanuts out of my hand but instead of landing like the Chicks do, they swoop down, grab and go. If I am late with the peanuts in the AM, they sit in a tree by my kitchen window and squawk until I get out there. Hysterical! They are the most fun and I especially love them for their early warnings to all the others when predators are around. They screech louder than anything I have ever heard. Best for your continued success. I love their blue color! I love the photos! I still need one for my AZ list. Fantastic photos of those comical jays! Sounds like it has been fun observing their interesting peanut gathering behavior. 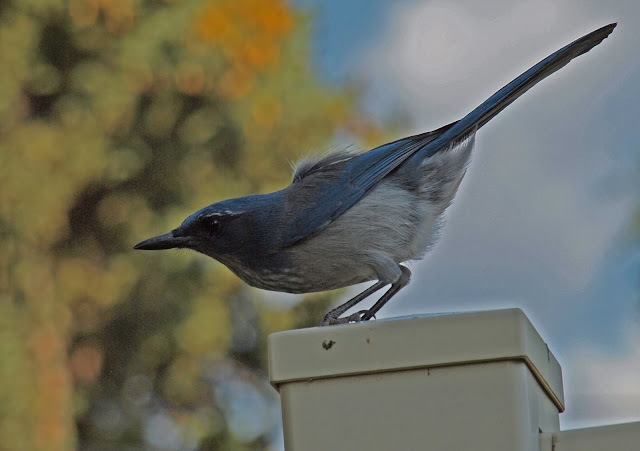 Super captures of the Scrub Jay! ....hahaha! They are just like our Blue Jays. They make quite a science of emptying our peanut feeder in quick time!